WE ARE TRYING TO BUILD A HOUSE IN KARIBA, ZIMBABWE. WE ARE INTERESTED IN THE RIVER HOUSEBOAT DESIGN. 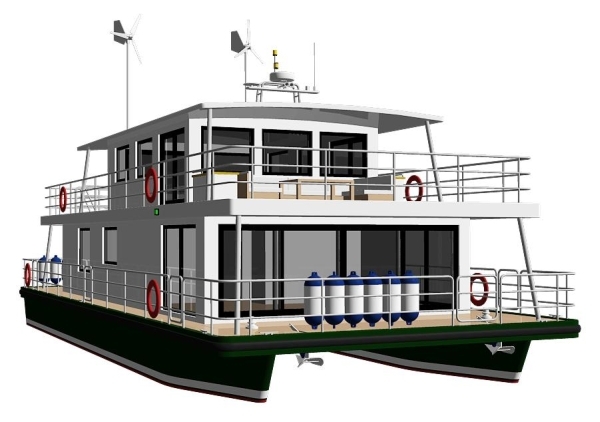 THE BOAT WILL BE USED ON LAKE KARIBA. PLEASE SEND US SOME INFOMATION ABOUT THE RIVER HOUSEBOAT. Done. Have a look in your mailbox. I’m interested in building you houseboats here in America. Can you please send me info? Profile/deck layouts and some idea of building details as I want to build in steel or aluminum. Jim, give me 1-2 days for reply in details. Hi there… i like your design very much. now i have the idea to built one in Suriname South America to take visitors on a tour off the rivers for one or more day’s. Do you have more details for me. I will built it with my friends over there. Profile/deck layouts and some idea of building details as I want to build in steel. Of course we can design charter houseboat for you. It is not expensive. Send us email telling more about your requirements such as key dimensions, draft, how many guests, crew etc. And we quote our service. Hi …..Many thanks for t he reaction on my mail. I have study your drawings of designs, and it is really my style what I had in mind. 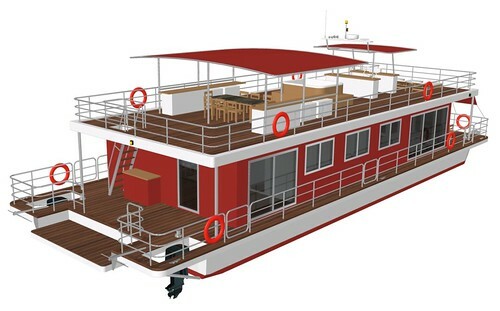 Now I’m thinking of building one almost like this one for cruises on the rivers off Suriname, with a maximum off 27 people. Captain and Crew 3 people, and guests 24, adults and children’s. I have in mind off a total length of 30 meters, width 9 meters, and the total height from top to bottom of 9 meters. The wideness and height can be smaller if it is necessary to keep the design as it is. As you see it’s a 2 storage boat. 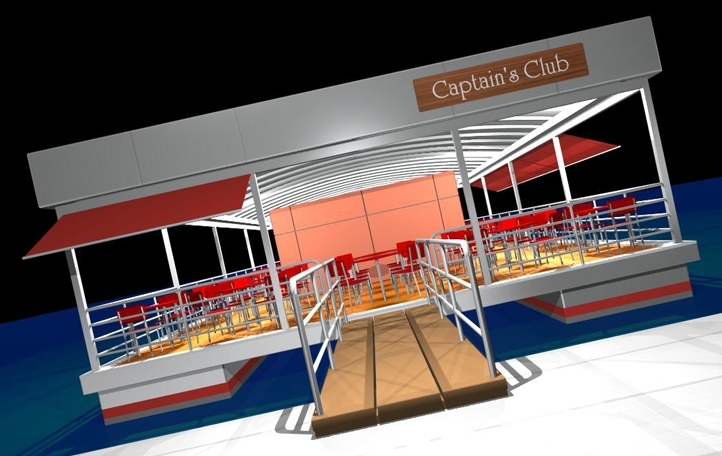 Top deck for captain and crew and maybe a royal suite for 2 persons, and a lower deck for 15 guests. 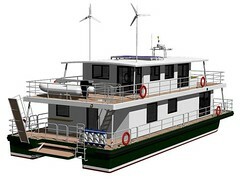 On the Lower deck you have 5 bedrooms (about 5 by 3 meters), 2 bathrooms with toilets for the guests. 1 living room (about 7 by 3 meters), with a bar and medium kitchen to cook for the guests. Maybe some storage place for things like a BBQ or other small things. The remaining space is just open to sit an see the few. 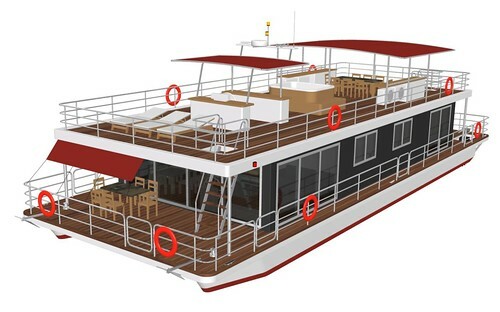 On the Top deck you have the wheelhouse (over the total wideness of the boat), 1 bedroom for the captain with bathroom and toilet, 1 bedroom for the crew (2 persons) with bathroom and toilet. 1 VIP bedroom for guests with their own bathroom. Storage room for food and drinks for at least 14 days or more. 2 extra toilets for guests and the remaining space is a living room with bar something like a special lounge. 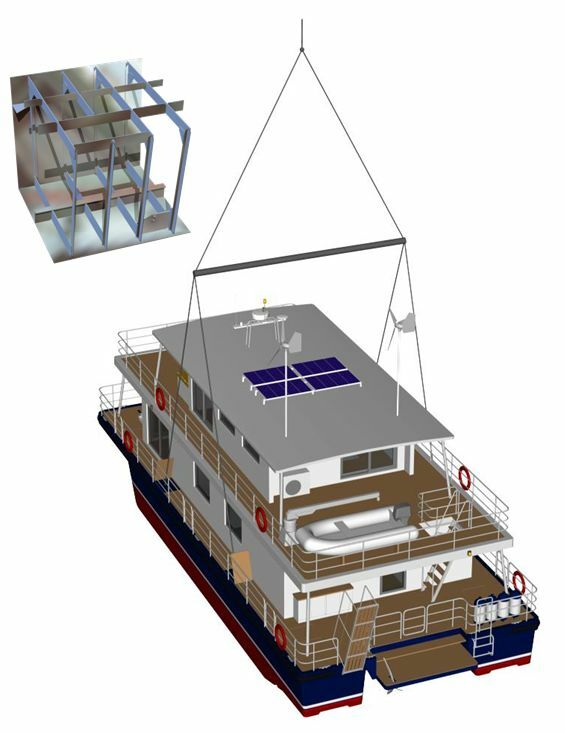 Also you will have a passage way from 1 meter wide and above that a glass roof to let the light of the sun into the boat. The passage on the side of the boat on the lower deck had to be wide enough for passing a wheelchair. At the rear end of the boat we will use 2 outboard engines of 150 to 200 horse power. Also in the middle of the rear end I want to put a elevator for carry 2 ski jets. 1 big one for 3 persons and a smaller one. On the top of the roof, I want a construction above the roof itself, at 70 cm high in a oval shape. (see the drawing) covered with canvas. This will allowed the wind to blow between the roof and canvas. On the original roof we will place 2 – 4 air-conditions machines and a storage for batteries because I also want to use 2- 4 windmills for electricity. Maybe it is possible to make a sketch first to see if the idea is right. In your mail you said that it is not expensive for a original drawing, but I want to know how much. If it is possible I also want to know what we will need further to finish the boat. What I mean is a cutlery. Any way: I like to see a response to meet and stay with the friendly greetings. in general we understand your idea and will give you the answer in a couple of days. Please check your mailbox.